IT’S NO SURPRISE that the live gigs of newcomers Mammal Hands caught the ears of Nick Blacka (bass player with trio-of-the-moment GoGo Penguin) – subsequently recommending them to Gondwana Records boss Matthew Halsall who duly signed them to his growing catalogue of new artists – for there’s more than a hint of Blacka’s band in this, their resulting debut release, Animalia, as well as echoes of early Portico Quartet. Yet their style is also defined by elements of electronica, classical minimalism, dance, Africana, and Indian classical, creating a richly creative blend which can, in equal measure, both move and excite. The strong Norwich-based trio comprises brothers Nick Smart (piano) and Jordan Smart (saxes), with Jesse Barratt on drums and tabla – their eight original compositions here very much on-trend with the current wave of eclectic, democratically-conceived contemporary jazz ensembles. And what a compelling first outing this is. Eschewing the traditional double bass element doesn’t, as one might expect, result in imbalance, thanks to the solid-chorded/octaved rhythmic piano of Nick Smart. Indeed, opener Mansions of Millions of Years – with influences and moods that might suggest e.s.t., Reich, Glass and Satie, as well as a raga pulse and energy – displays the impassioned intent of this one-time busking band, Jordan Smart’s escalating soprano sax whirling and crying over the busyness of piano and drums. The three players clearly share an empathy in composition and performance, delivering a varied sound world – the brief and more contemplative Snow Bough spacially glinting to falling piano and sax melodies which possess delightful Japanese koto-like clarity. A brooding sense of anticipation fills Kandaiki, Jordan Smart’s clipped vibrato lines very much reminiscent of Portico’s Jack Wyllie – and here can be found the magic of the trio, as piano and sax intertwine contrapuntal melodies and harmonies over a simmering, near-perpetual 5/4 piano and drum figure. In contrast, the percussive, yet melancholy, open landscape of Spinning the Wheel finds Jordan Smart’s soprano in folky, yearning vein, Nick’s dark-set low piano chords shrouding the piece in mystery. Suitably-titled Bustle teems with life to its pianistically-tricky seven-beat ostinati and trip-up pauses; and Jesse Barratt’s complex, ticking momentum, including subtly hollow tabla, is great to focus on. Luxuriant Inuit Party presents a particularly rich combination of tenor punch, tightly-clustered piano chords and solid four-square beat which also offers a tangible improvisatory glimmer of their live act. Upping their game still further – and a real stand-out – Street Sweeper revels in an infectious groove, the Smart brothers sharing melodies over an effusive left-hand piano hook, Barratt shuffling enthusiastically as well as offering a joyous touch of Cuban clatter. Larger-scale Tiny Crumb closes the album, highlighting the trio’s aptitude for building and elaborating on themes, moving up through keys with ever-increasing urgency. Again, Nick Smart’s all-encompassing piano presence is impressive, sharing with Jesse Barratt its rhythmic intensity, all the while encouraging the apparent vigour of Jordan Smart’s tenor (the end of his white-hot, Pharaoh Sanders-style soloing induces a desire to applaud! ); and then, a hypnotic, tabla-decorated end-piece which hints at a much longer play-out than afforded here. 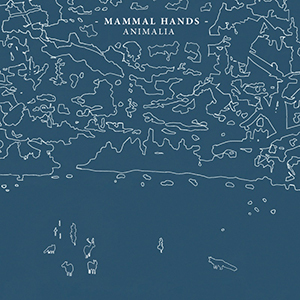 As a debut, Animalia is captivating, yet also feels like just the beginning of Mammal Hands’ creative musings. In their multifarious musical minds, not to mention their considerable instrumental proficiency, Gondwana have signed a breakthrough band capable of hitting the heights. Catch a glimpse of the band at 2013’s Mostly Jazz Festival, as well as the official video for Mansions of Millions of Years. Releasing on 15 September 2014, pre-order/purchase the album (and preview a couple of tracks) at Gondwana Records’ Bandcamp Store.